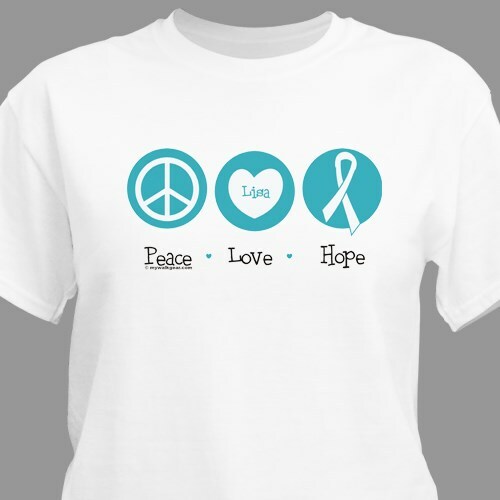 Whether on a fund raising walk, going to the mall or visiting a close friend this Peace, Love, Happiness Personalized T-shirt looks great and spreads Awareness about Ovarian Cancer. Our Peace, Love, Happiness Ovarian Cancer Awareness T-shirt is available on our premium white 100% cotton T-Shirt, machine washable in adult sizes S-3XL. Also available on Ash Gray. Includes FREE Personalization! Personalized your Peace, Love, Happiness T-shirt with any name.